Cream of Chicken Soup with Risotto and Asiago Cheese | Kitchenpants! If you’ve ever been around me when I am hungry (like really hungry…not just the “I could eat” hungry, but the “I NEED TO EAT RIGHT THIS INSTANT! !” hungry), you know that I am extremely unpleasant. A former (thank goodness*) co-worker used to call this phenomenon “being hangry” as it is anger that stems from the extreme need for sustenance. Signs of Hangry Ali include clipped sentences, loud and long sighs, frequent eye-rolling, and immediate expletives when you ask me, “Have you eaten?” Because, no, clearly I have not eaten. And so, in true Hangry Ali fashion (you can’t hear the sighing or see the eye-rolling as I write, but trust me, it’s happening), I give you this soup as my take on cream of chicken soup with rice. I do not like cream of chicken soup at all because there’s something just nasty-sounding about “cream of” anything, but I would totally eat a whole bowl of this stuff right now because, yes, I am starving, but also because this is really, really good. To make this soup, you will need roasted chicken. 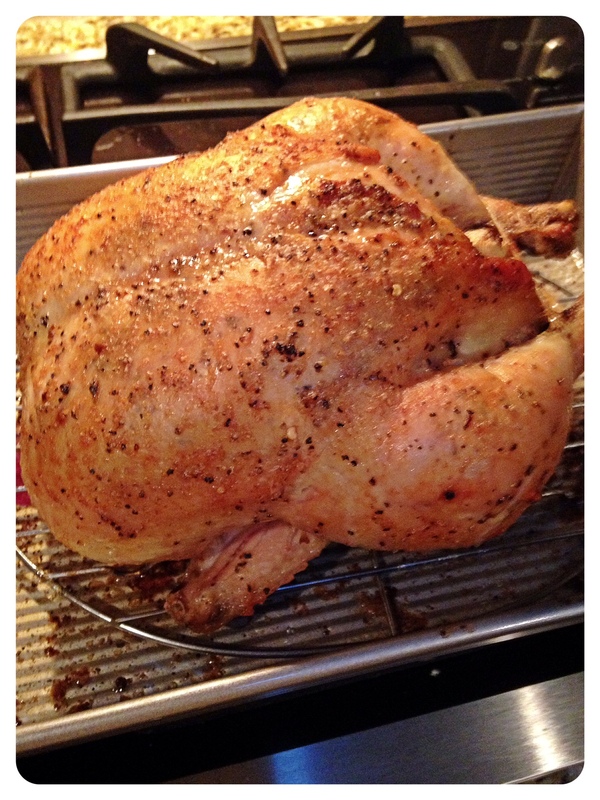 You can make my recipe for a roasted chicken or you can buy a few rotisserie chickens from the grocery store. I used a 6 pound chicken to make this batch of soup and it yielded about 5 and 1/2 cups of shredded meat. I am picky and I only use the white meat, but if you want to use dark meat, you certainly can. You will also need to whip together a little risotto. Risotto is Italian Arborio rice and it is the needy boyfriend of rices: once you start making the rice, you are chained to it until it is done. Unlike the needy boyfriend, though, risotto delivers delicious return on your time investment. The risotto adds good body and lots of flavor to this soup, so it is definitely worth the effort. Shredded Roasted Chicken – 5-6 Cups of meat. Definitely add a little more if you have it, but don’t use less. Shred your chicken meat from your roasted chicken or store-bought chicken and set it aside. Prepare the Risotto: Saute the onion in the oil and butter for 3 minutes. Add the rice to the onion and butter and stir it around for 2 minutes. Stir in 1 cup of chicken broth…and continue to stir it until the broth is absorbed by the rice. Repeat with the next 2 cups of broth: add one 1 at a time and stir until just absorbed. Do not overcook it. The end result will be a wet sticky rice with a little bite to it. Set the risotto aside. Chop the bell pepper up – small dice. Set aside. Grate the Asiago cheese. Set aside. Peel the cipollini onions. If you’ve never dealt with these little guys before, you might want to peel them before you get started with this entire recipe because these are a pain to peel. They are, however, well worth the effort. You are going to caramelize these onions, and their high sugar content make them so very, very good in this soup. 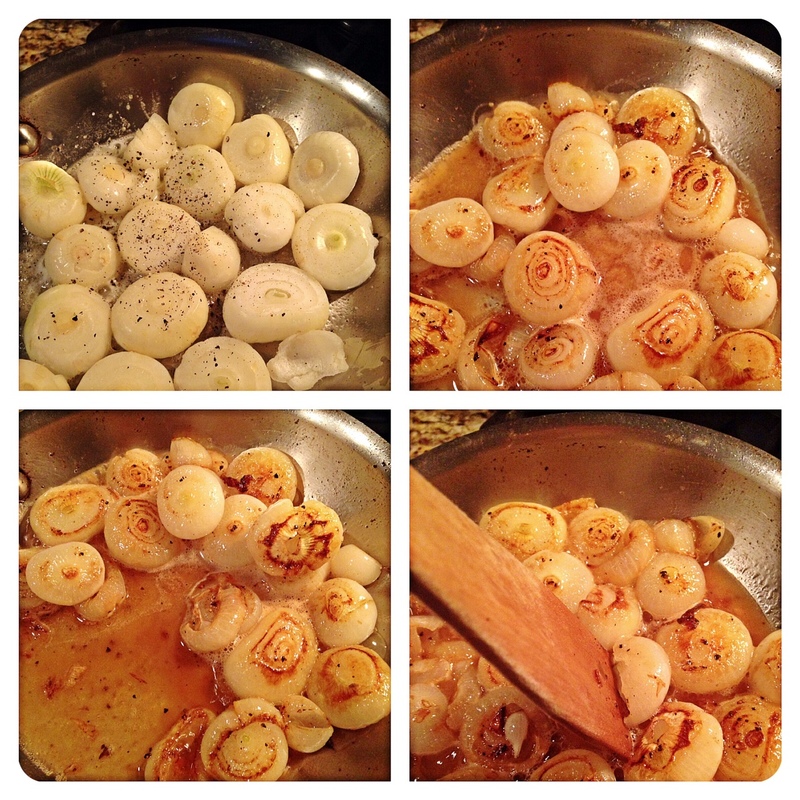 Once the onions are peeled, sauté them: Melt 1 tbs. of butter in your small skillet and add the onions over medium-high heat. Let them work in the pan until they carmelize lightly (don’t overcook them as they are going to be cooked again in the soup and you don’t want onion mush), turning them a few times as you work. When they are done, deglaze the pan with 1 tbs. of white wine and sprinkle a bit of salt and white pepper on the mixture. Pour the mixture into your small mixing bowl and cut the onions up with scissors or kitchen shears. (Don’t use a knife and cutting board for this – you want to preserve the butter and wine sauce that you have created.) Set aside. In a large soup pot, make a roux over medium heat: Melt 2 tbs. butter and add 1 tbs. oil. Let the butter and oil mix and then whisk in 3 tbs. of flour. Combine the fat and flour until you get a nice golden color. 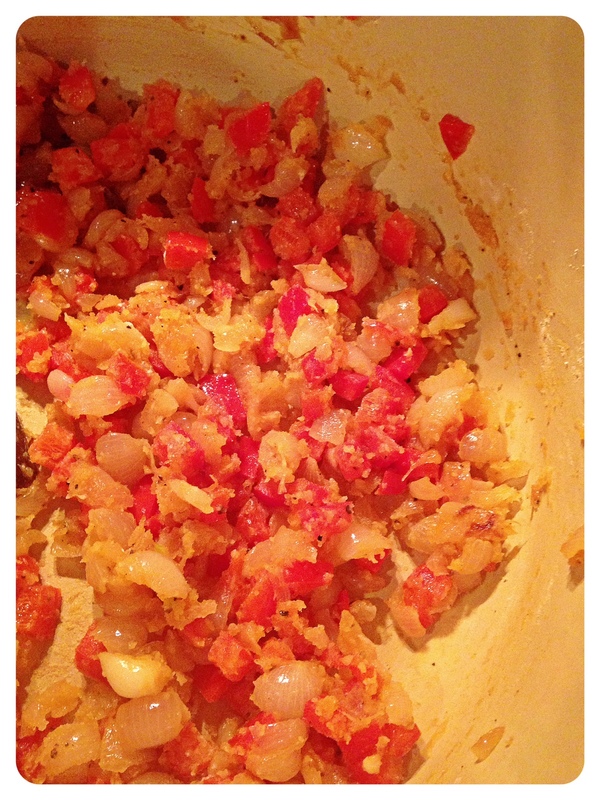 Add the sautéed cipollini onions and chopped bell pepper to the roux. Mix to combine. Add the chicken to the mixture and give it a quick stir. Mix in 2/3 cup heavy whipping cream. Increase the heat and bring the soup to a light boil. Use your wooden spoon to pick up any bits from the bottom of the pan. Once the soup starts to boil, reduce the heat, add the parmesan rind, and let the soup simmer for 15-20 minutes. 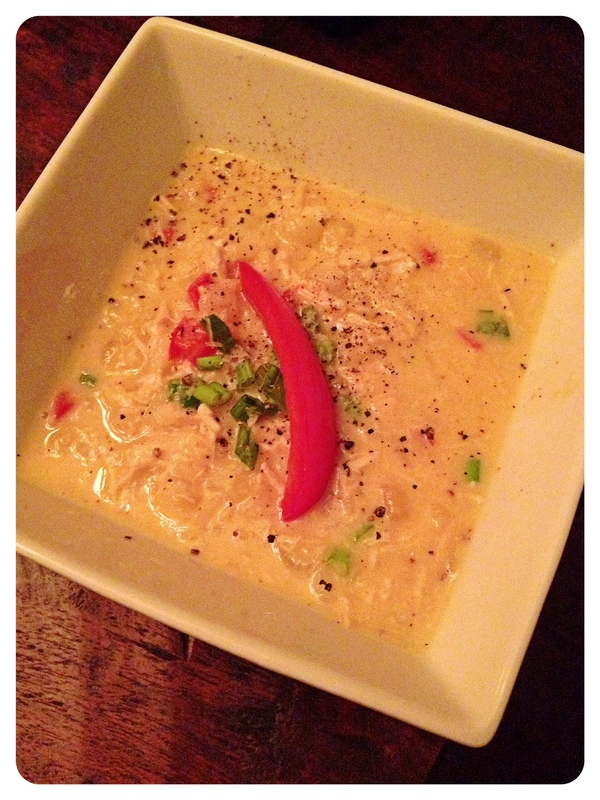 Don’t worry if the soup isn’t very thick at this point…you still have risotto and cheese to add. After 15-20 minutes, remove the soup from the heat and stir in the risotto and Asiago cheese. Check the thickness. If the soup is too thick, cut it with a little broth. If it’s thin, add a little more heavy cream and heat it on low to thicken it up. I used a little salt, black pepper and white pepper and added a dash of Lawry’s seasoned salt (just a little dash) to serve along with black pepper, chopped scallions, and a red pepper slice. Enjoy…I’ll be here with my *@&! juice. It is definitely rich. A bowl and maybe a little salad makes a meal! Pingback: 3 Day Juice Cleanse by Simply Fit Foods | Kitchenpants!